Opportunity Zones are an economic development tool promoting investment in distressed communities through legislation enacted by the Federal Tax Cuts and Jobs Act of 2017. Communities have been designated as Opportunity Zones by the U.S. Department of Treasury, incentivizing investments in these distressed communities to better address local needs in areas such as business growth, improvements to housing, and improvements to infrastructure. 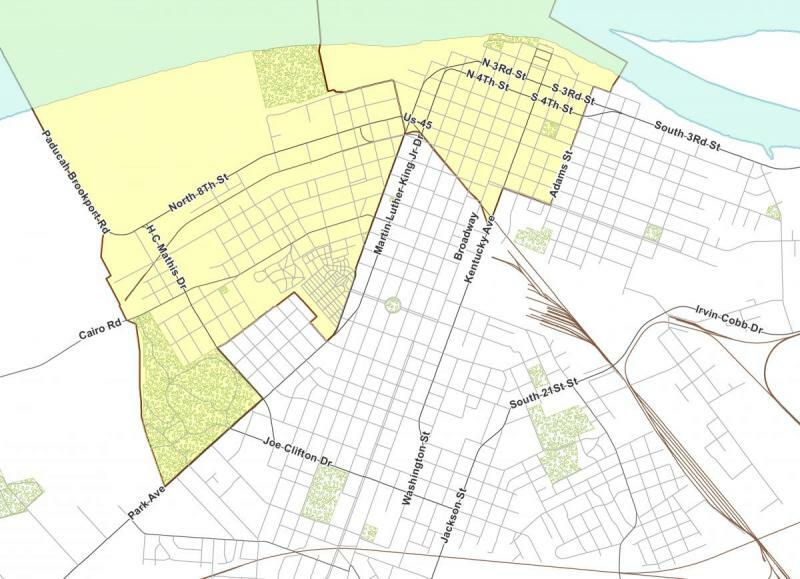 While Paducah is filled with opportunity, the governor has selected two census tracts (pictured) located along the Ohio River as our official Opportunity Zones. U.S. investors currently hold an estimated $2.3 trillion in unrealized capital gains. Opportunity Zones leverage this pool of money to promote economic development by providing federal capital gains tax advantages for investments made in these areas. Investors can realize deferral and reduction of capital gains taxes in investments held for at least five years with additional incentives available for investments maintained in Opportunity Zones for 7 and 10 years. To be eligible, investments must be made through Qualified Opportunity funds which are vehicles formed for investing in eligible Opportunity Zone property. To maximize the benefit the majority of Opportunity Zone investment will occur before December 2019 as investors cannot realize the full benefits of the program on investments made after 2019. Evaluate current conditions in the Opportunty Zones to identify needs such as business, housing, and/or infrastructure. Create a well-articulated plan to achieve community development goals and investment needs. Adapt local development programs and incentives to make local Opportunity Zones more attractive to investors. Secure site control where possible increasing project readiness. Developing materials that effectively communicate investment opportunities to investors and Qualified Opportunity Fund managers. Why Does Paducah Need a Strategy? There are thousands of Opportunity Zones throughout the United States; Kentucky has 144 zones in 84 counties. While each Opportunity Zone is eligible for the same tax advantages, all Zones are not created equal. It is estimated that there is over 2.3 trillion dollars in eligible capital gains eligible for investment – although only a percentage will actually be invested in Opportunity Zones. All Opportunity Zones will compete for investment, but some Zones will stand out immediately due to clear pro-investment market conditions. Paducah will likely be competing for investment with large MSAs (Metropolitan Statistical Areas) in the mid-west and south-east regions. Investors looking at Opportunity Zones may not consider or be aware of the advantages offered by Paducah’s Zones. Furthermore, potential local investors such as business owners may not know how to take advantage of Opportunity Zone incentives and the potential to assist with local expansion or capital investments. The City of Paducah will market our opportunities directly to investors through a marketing program utilizing collateral materials, social media, and community websites to highlight our Opportunity Zone investment opportunities.